The Butler Bulldogs traveled to Terre Haute, Indiana as the Indiana State Sycamores played host in what was a great game, well mostly. Actually, Indiana State played a great game. Butler looked lost, out-toughed and overwhelmed at times throughout the game. In what I believed to be a trap game for the Dawgs, Indiana State took advantage of poor shooting from most of the Butler squad and came out with a hard fought win. How teams respond to a loss is key in determining the psyche of a team – can they put it behind them, grow from the loss, and play their game? 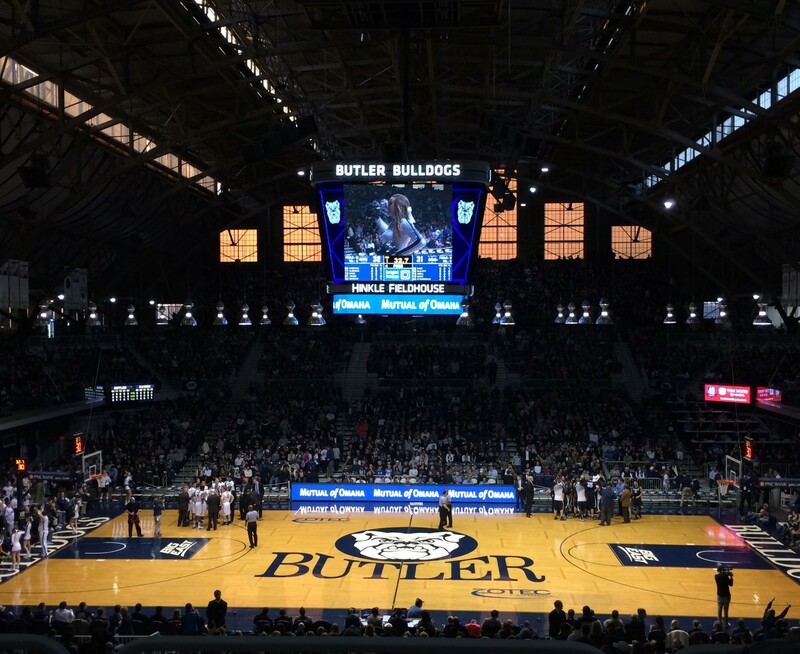 Butler hosted the Cincinnati Bearcats in an anticipated rematch of last year’s buzzer beating Butler win on Cincinnati’s home court. The Bearcats came to Hinkle with a top 25 ranking and a well traveled crowd of support. I think Cincinnati fans were louder than Butler fans for a good portion of the game. Both teams played a great game, showing resiliency and toughness on the court. In a change to starting lineups, Kamar Baldwin and Sean McDermott were traded in for the likes of Kelan Martin and Avery Woodson. That was most likely for defensive purposes, but I’m only the avid fan and may read too much into things. The key to growth is addressing whatever the issue may be and trusting the process. I appreciate Coach Holtmann’s rhetoric and position about growth as a team in this aspect (I appreciate and trust his decisions all the time). As Butler prepares for the lead up to winter break, they will play Indiana at Banker’s Life Fieldhouse on Saturday, December 17th and then host Vermont on Wednesday, December 21st. It’s time to recount one of my favorite aspects of college basketball, the upset-minded teams that take down perennial powerhouse programs! Florida Atlantic University was given little chance prior to tipoff as they traveled to Ohio State this past week. In a game that seemed to surprise even the FAU players, attendees were treated to some “free” basketball as the game went to overtime. Early in overtime, Ohio State grabbed a slight advantage. FAU continued to hang around until, with one second remaining, Nick Rutherford drove the lane and hit the game winner. With just a 3% chance of winning, FAU holds the 2nd least likely win to date this season. UT Arlington still doesn’t seem to be registering on the radar for most following college basketball – at least not until they traveled to another mid-major school enjoying success this year. UT Arlington defeated St. Mary’s as they traveled to California in what I expected to be a great matchup and would be telling how both of these teams will do as they progress through the season. Watch out Conference USA, UT Arlington is looking to take on the conference and dance their way into the tournament this year. Middle Tennessee picked up a nice win over power conference opponent Vanderbilt this week. In fact, it was an emphatic 71-48 drubbing. Vanderbilt seems to be demonstrating its consistency in continuing to not live up expectations. Portland 90 vs. UT Rio Grande Valley 89 (2OT), 89 possessions – Down 13 with 6:53 left to play, Portland looked like it was prepared to sustain an upset from the visiting Vaqueros. However, closing the game on a 16-6 run forced overtime. Eventually, Gabe Taylor tipped in the winning basket with 2 seconds left to conclude Portland’s comeback. Central Michigan 107 vs. Green Bay 97, 89 possessions – For the amount of time I spend reading about college basketball, I never considered to look for who is the leading scorer this year. Well, fortunately Central Michigan was part of the fastest games of the week so I could read about how Marcus Keene, the current leader in scoring this season for Division I basketball, poured in 40 points and handed out 11 assists in this high scoring game! Campbell 97 vs. The Citadel 91, 89 possessions – I’ve learned so much this week. Did you know that Campbell is the Camels? They trailed by 12 at halftime and used runs of 16-9, and 9-0 to move past The Citadel for a fast paced, high scoring affair. Virginia 76 vs. Eastern Carolina 53, 56 possessions – After losing their first home game in nearly two years, former Indiana Mr. Basketball, Kyle Guy, led the three-point onslaught against visitors Eastern Carolina. Their dominating win righted the ship for the Cavaliers as they prepare to close out non-conference play. Texas A&M 80 vs. Denver 58, 59 possessions – In a game in which 10 Aggies players played at least 11 minutes each, Texas A&M looks to finish non-conference play taking on Arizona. I don’t expect Texas A&M to make much noise in the SEC this year, but they may be good for a few surprises along the way. Loyola Chicago 72 vs. Milwaukee 56, 59 possessions – The former Horizon League Ramblers shot 67.5 percent from the floor and cruised to a win over the Milwaukee Panthers. Loyola has a great chance to enter conference play with double digit wins. Very little activity to look forward to this week as colleges are on the precipice of finals week. As a result of waiting through the week, we will be gifted with some fantastic matchups on Saturday! It would be a great day to relax and watch some hoops with friends or family! Middle Tennessee vs. Belmont, 8:00p.m.